WARNING. Only the first paragraph is boat related. Despite the overnight rain today was fine, cold and sometimes sunny. I took the opportunity in the afternoon to start applying the black gloss topcoat to the port side below the gunwale. I used the wheelbarrow wheels to get the side of the hull away from the edge of the wharf. If the weather remains fine tomorrow I might be able to lightly sand down the same area and get on a second coat of paint. 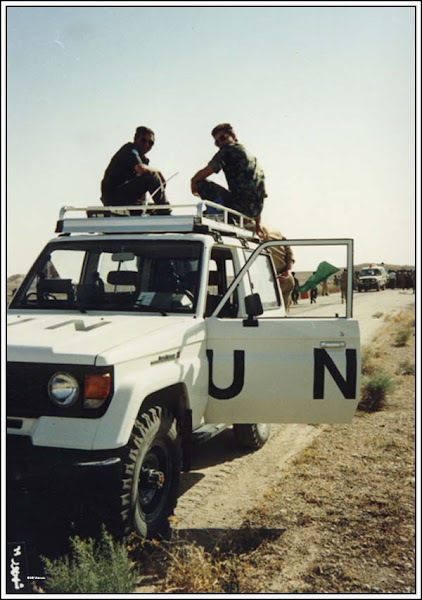 Recently I came across some old photos taken when I was with the UN in Iran. UN military observers were expressly forbidden to take photos whilst in the mission and could be expelled if caught doing so. Consequentially all of my photos were taken towards the end of my 13 month tour or obtained from other observers (letting them take the risk of expulsion!). Iran and Iraq had fought a 10 year war reaching stalemate. Both sides eventually realised the Soviet Union and the West would supply them with sufficient resources to fight, but insufficient to win. In order to fund their war Iraq and Iran had to keep producing cheap oil. Eventually both nations accepted UN Resolution 642 and the UN mission was formed. The role of the mission was to supervise the cease-fire between the two front lines and report any violations by either party to the UN Security Council. 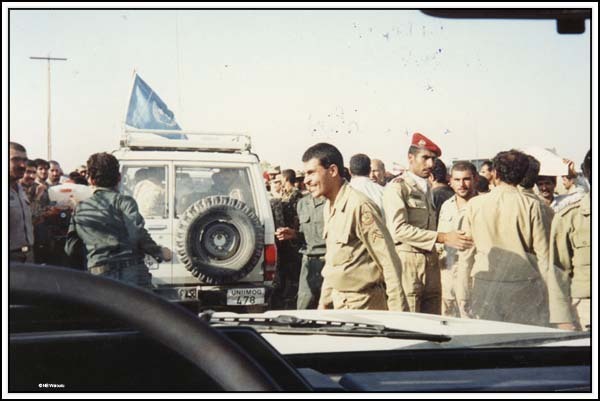 This was to be a confidence building mission allowing the situation to “normalize”, eventually resulting in a peace settlement. Military personnel for the mission were mostly drawn from the armed forces of nations who were trading partners with Iran and Iraq. I was a member of a 10 man contingent sent by NZ. Upon arriving in the country the first thing I noticed was the significant cultural difference between Iran and NZ. Actually there were significant cultural differences and values between UN personnel from the participating nations! 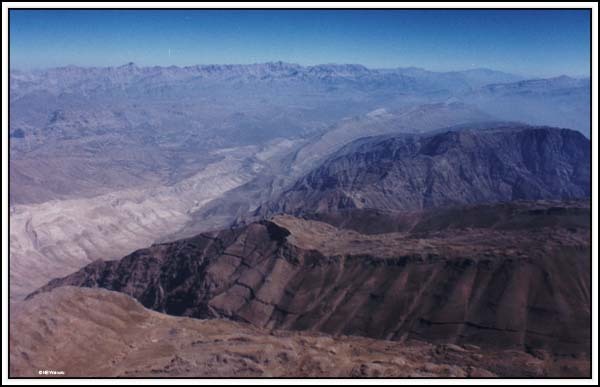 On the second day in the country I was flown to the south of Iran in an Iranian Air Force aircraft where I spent my first six months commanding a patrol base in the southern sector. The flight down made me aware of the second significant difference. And then it gets VERY flat. I was to subsequently discover there was one 40ft high hill in the 100km length of my entire patrol frontline. It made interesting navigation; particularly as there were no road signs after 10 years of war. Go off the road and you might end up in an unmarked minefield. 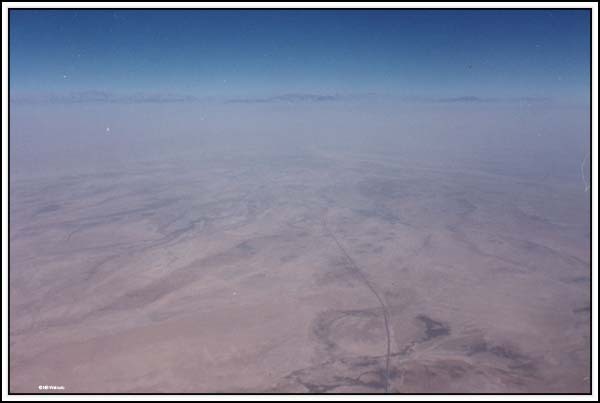 No doubt all this flat and brown felt like home to the Australian troops! My first position was northern patrol base commander in the Southern Sector. 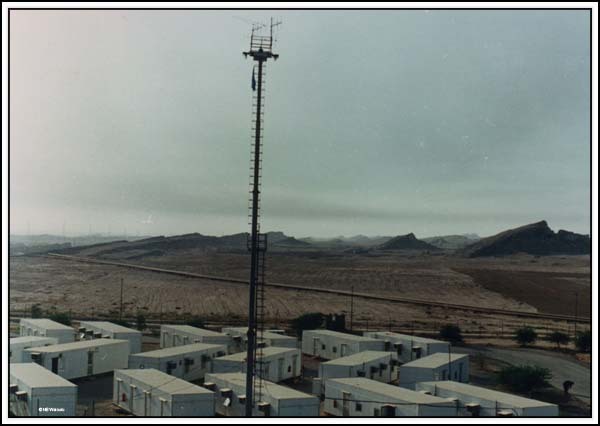 The sector headquarters was located further east in a former Italian oil field camp. 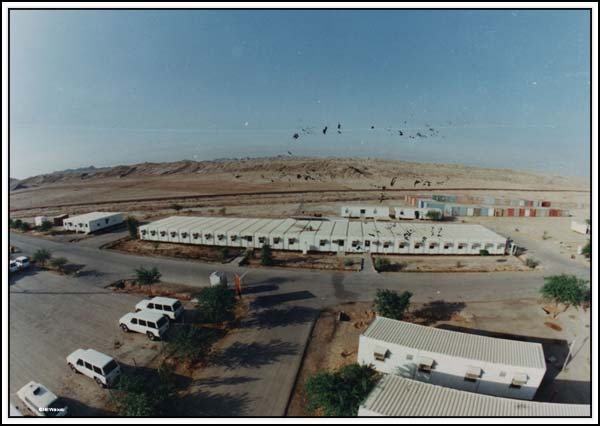 The accommodation was in transportable cabins. The large building in the middle of the photo is the kitchen and dining halls. 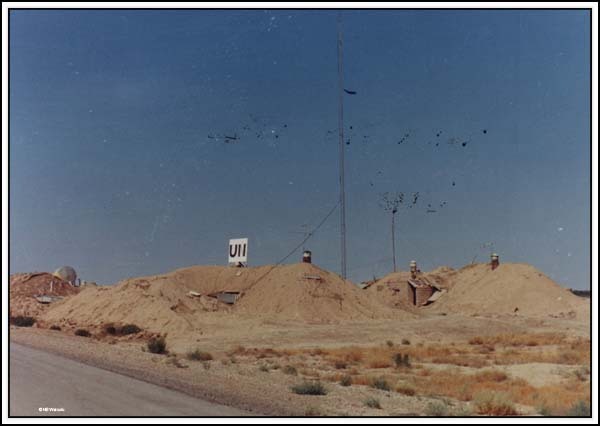 UN to the left and Iranian to the right. Although I spent six months in the southern sector I only had a total of five nights in the air-conditioned cabin at the sector HQ. The remainder of my time was spent on patrol. My real home was here. 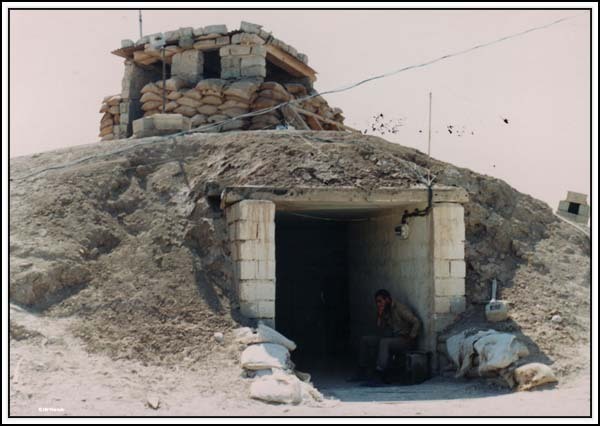 Living in an underground bunker in the grounds of a former Iranian Army chemical decontamination facility. Contaminated land all around me. So much for Health & Safety! 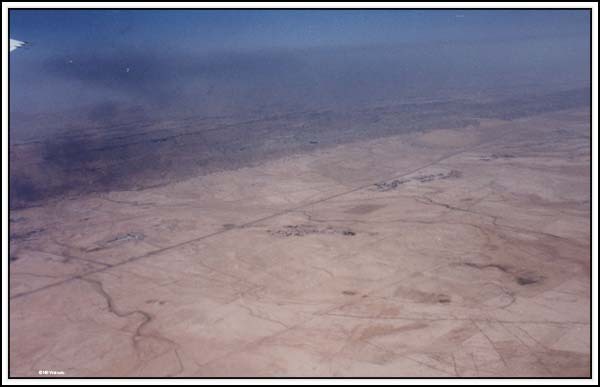 The middle patrol base was at Hoseineyeh. Another underground bunker. I spent a week here and can still smell the long drop toilets in the adjacent room. 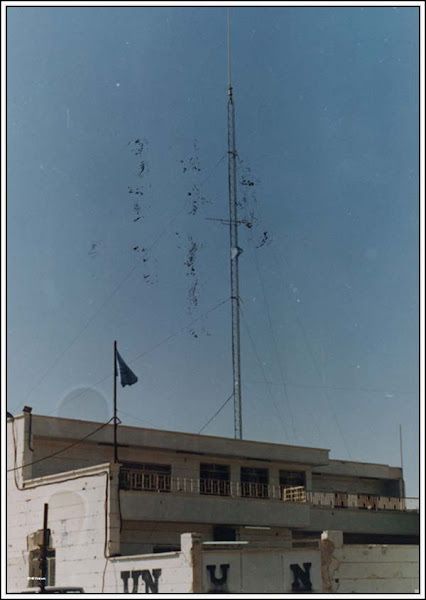 The next patrol base was located in the city of Koramshah which had been almost totally destroyed during the war. 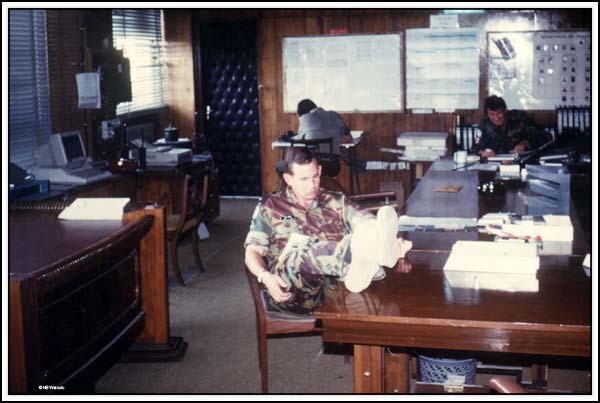 However the UN personnel at least had a building with rooms in which they were accommodated. The second half of my tour was spent as the sector operations officer in the central sector of the frontline. 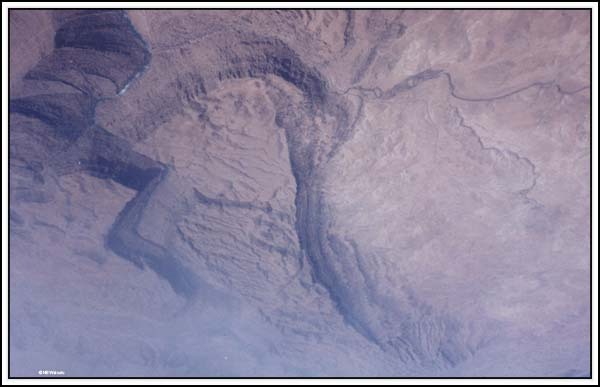 This area incorporated the traditional major invasion routes. Apparently Alexander the Great invaded through the same passes. As sector operations officer I was kept very busy. 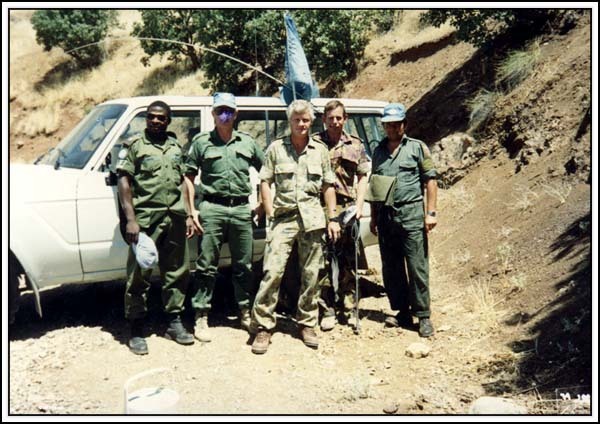 L-R Patrol base commander (Nigeria), My opposite number on the Iraqi side (Ireland), My Sector Commander (Australia), Me (NZ) and the opposite Sector Commander (Norway). The second major operation was the repatriation of prisoners of war. 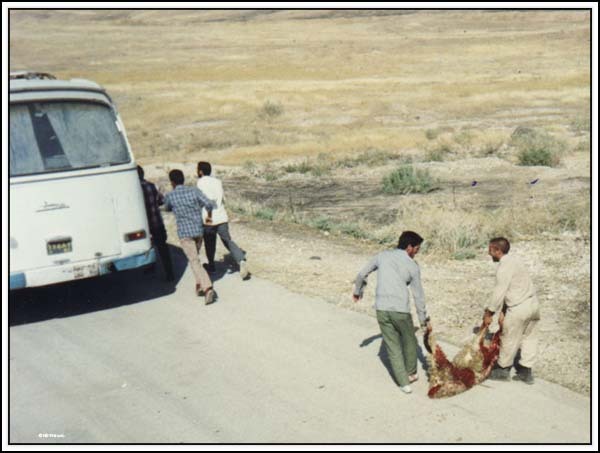 Saddam had decided to “make peace” and we needed to coordinate the repatriation operation. 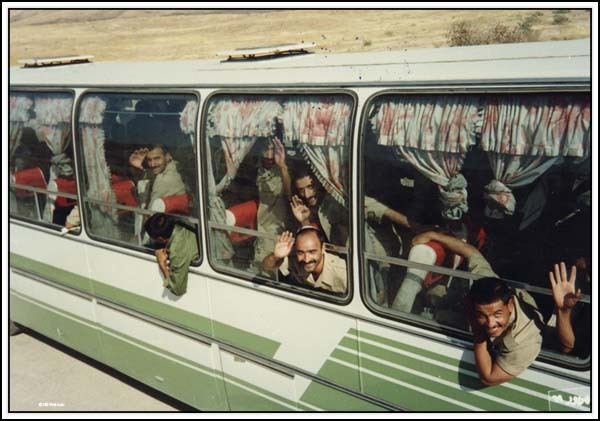 The Iraqi PoW’s were bought to the frontline in bus convoys over several days. This was a time of great joy to the Iranians on our side of the line as it was tangible evidence the war was over. However the goats were the not very happy as several hundred of them had their throats cut. The area was awash in blood. The Iraqi’s all looked fit, healthy, and very pleased to be going home to their families. In the usual Iranian way the military police decided to muscle in on the operation. Suddenly there was a huge crowd of uninvited “guests” in the middle of “No man’s land” with everyone giving “advice” and orders and no one listening (usual Iranian mess). The situation quickly became chaotic. We had an overexcited armed crowd going nowhere. Someone could easily have been hurt. It could be us! So we packed our bags and left them to it! Two interesting points arose from this operation. In the first few days there were no injured or maimed PoW’s repatriated by either side. Everyone was fit, happy and healthy! It wasn’t until several days later that both sides started quietly to repatriate the prisoners they didn’t want the media or public to see. The second point was my concern about the fate of all the happy Iraqi’s. 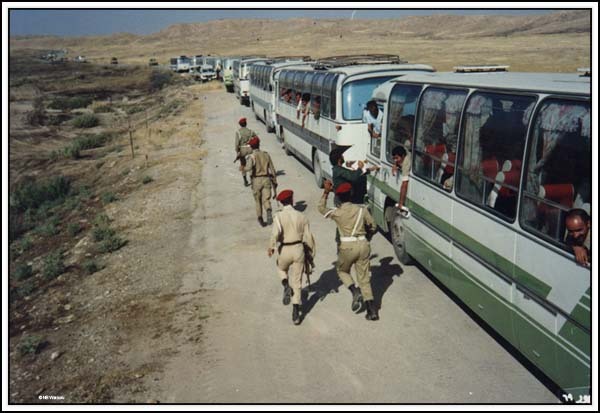 Saddam had buses waiting for them to take them directly down south to the border with Kuwait. How many thousands of them survived a 10 year war, imprisonment, the joy of repatriation, only to be killed in the following months during Operation Desert Storm? A real part of recent history. Thanks for sharing that with us Tom.